Throughout my whole swimming career, I’ve never been disqualified once. I’ve never been warned once. I’m trying to focus on the 100 and 200 breaststroke now. There’s no point concentrating on the 50 when it’s not in the Olympics. I’m not going to quit the 50 but it’s not my priority any more. I’ll do it but as part of my bid for gold at the other distances. I woke up on the plane this morning and was turning on my phone and I had to put my pin number in. That’s when I realized that since the age of 10 I’ve been using 2012 as my pin number. But now that I’ve won gold in the 2012 Olympics, I’ve achieved that goal and, for the first time in 14 years, I’ll have to change my pin. I cannot control what goes on in another lane and this is how I focus on the Games. There is no point in being nervous of other swimmers. It’s just about focusing on yourself and what you need to do in order to perform at your best. Cameron van der Burgh was born in Pretoria, South Africa. 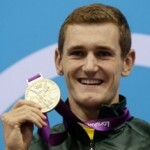 He is a South African swimmer. He is Africa's first home-trained world record holder and individual male Olympic Champion. Twice he has won the FINA overall World Cup. He won the world title in the same year at the Rome championship, also in the 50 m breaststroke. He won the 50m breaststroke at the 2010 Commonwealth Games in a time of 27.18 seconds in a new games record and the 100m world title at the 2010 short course world championships. He won the 100m breaststroke gold medal at the 2012 Summer Olympics in a new world record time of 58.46 seconds, and paid tribute to late world champion Alexander Dale Oen afterwards.